I wanted a semi-healthy, non-chocolate snack for mid-morning. Hey, I like blueberries! That looks good. What I didn't notice first was the count - only five. But I noticed immediately when I opened the box that this was NOT a full box. 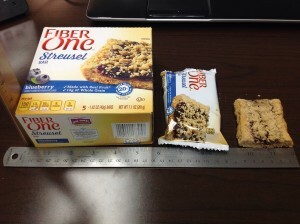 If one were to build a box and wrappers to fit the actual food contents, the box would be about a third the size it is. For your edification and invitation to join me in impotent rage, I give you the ruler-placed packaging from box to snack. That would piss me off big time! If you like blueberry have you considered Belvita blueberry biscuits? They're good and filling. I tend to only eat them when traveling, and 2 of the four in a package one day, then i finish the rest the next day.